Planning a Trip to Bali with Kids? You Need This! Are you planning a holiday in Bali? Whether you are going during school holidays or school term, I have found the ideal way to keep the kids entertained and occupied. Let’s face it, kids get bored easily. From the minute you are on the plane, the ‘Are we there yet?’ questions begin. You don’t want them to spend the entire holiday on their mobile devices but what else can you do? I have found the perfect solution. - ‘My Awesome Bali Adventure - A Travel Journal For Kids, written by Eliza McCann and Phillip Gwynne. It has everything you are searching for to keep the kids busy and have a memento of their awesome holiday. From the minute you step onto the plane until you return home, this journal has it all. There are questions to complete about their flight and information about Bali to get the kids excited. One of the things I love about this journal is that it is suitable for all the family.. Kids will enjoy the word searches, crosswords and puzzles, younger kids have the opportunity to colour and play spot the difference, While there are also plenty of pages for the older kids to write about their experiences. 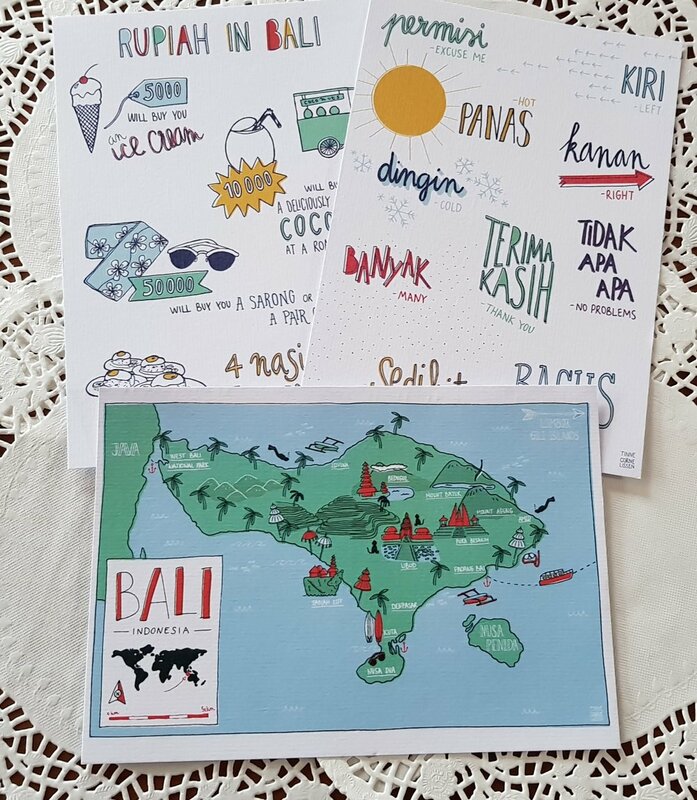 Bahasa Indonesia is of cause the main language spoken in Bali, and throughout the journal there are plenty of fun ways to learn a little Bahasa by completing fun activities. In fact there is so much information packed into this journal, I can’t believe someone hasn’t thought of it before. Your kids will treasure this book for years to come. There are even spaces for all sorts of cool stuff that the kids have collected. They can glue in boarding passes from the plane trips, entry tickets to places they have been to in Bali or perhaps even that menu from a favourite restaurant. I was lucky to receive a couple of postcards with mine, maybe you will too. As a former Indonesian teacher and a parent, I can see that this is packed full of value. Worried the kids are missing out on all that learning at school? Worry no more, they will learn so much language, culture, geography, even a little natural science from completing this journal and take home amazing life experiences that they can never learn in the classroom. Best of all they will have had an Awesome Bali Adventure. 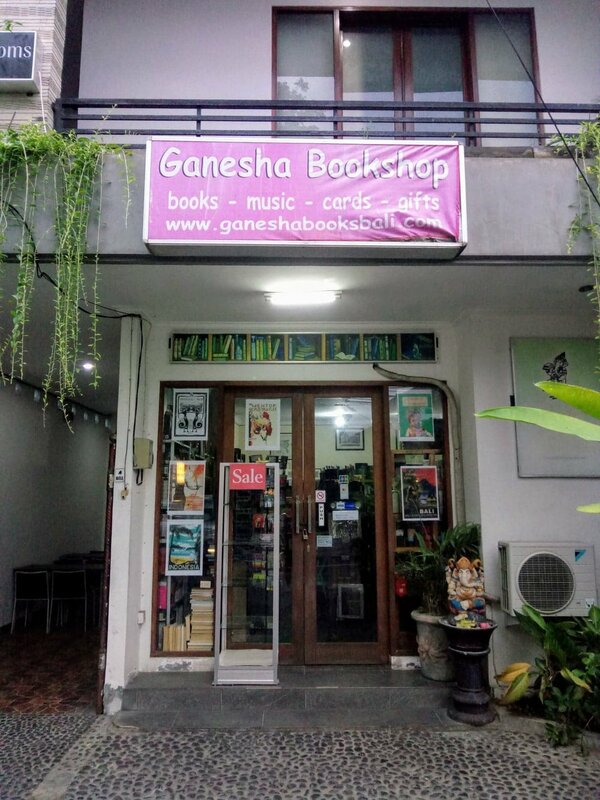 Looking for an awesome Bali Adventure to read with the kids while on holiday too? 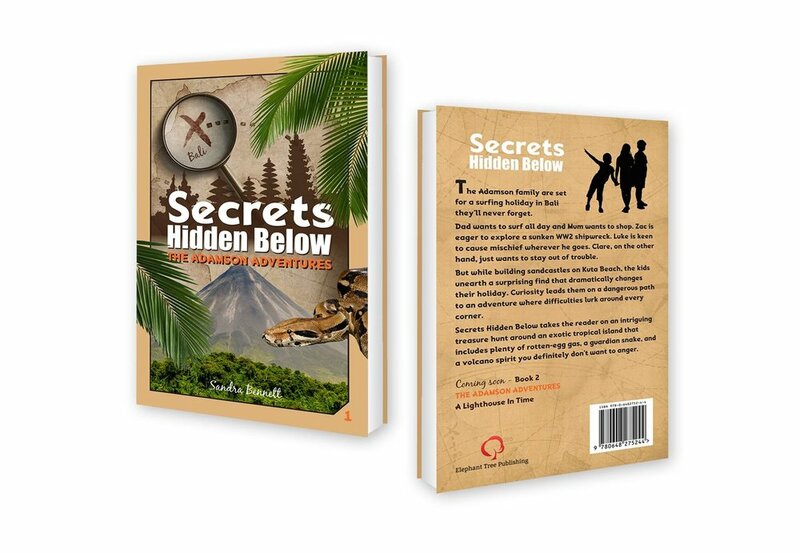 Don’t forget to check out my own chapter book for kids aged 7-12, ‘Secrets Hidden Below.’ Join the Adamson family in an adventure of secrets, mystery and intrigue. There is pirate treasure to be found, but beware the guardian snake, lots of rotten-egg gas and a volcano spirit you don’t dare to anger. To learn more about ‘Secrets Hidden Below,’ you can find it right here on my website. Simply click on the link at the top of the page to my books. If you arrive in Bali and still haven’t purchased a copy of these awesome adventures, don’t fret. ‘My Awesome Bali Adventure’ is available in all Periplus bookstores throughout Bali. ‘Secrets Hidden Below’ is available at Ganesha in Ubud, Biku in Seminyak and will soon be arriving on the shelves at Spellbound in Seminyak. Are you planning a holiday in Bali? What are you looking forward to most of all? Please leave a comment below. January has been a month of massive learning. I set myself quite a long ‘to do’ list for the year, which including great chunks of writing, I planned to learn more about marketing. This means taking myself right out of my comfort zone. I consider myself a typical crab who is happy to hide inside her shell. As a published author who needs to spread the word, this isn’t good or effective. From day one, I took the plunge and signed up for a 30 Day Social Media Challenge. The idea being to learn how to engage better with my followers on my Author Face Book Page. I have found it to be much more of a learning curve than I expected. Although I knew the final challenge at the end would be my most difficult. During the month I have learnt to engage with my audience in an open and at times deeply honest manner than I ever anticipated. I began sharing thoughts and moments of my life that I would not have shared in a public domain before. Part of the learning was to realise that people want to know the story behind the stories. I will endeavour to give more of that from now on. Interestingly another post that had a lot of attention was my one about the inspiration behind the writing of my chapter book, ‘Secrets Hidden Below.’ I really appreciate the interest this was given and will continue to write small bits of information about the book’s journey to eventual publication. As I have already mentioned the final task was without a doubt the hardest. It was spread over two posts to ease us into it. The first one took me so far out of my comfort zone I couldn’t believe I did it. Being asked to put myself on camera in a photo is hard enough, but to expose myself on a video, I didn’t think I could do that. I found it to be one of the most nerve wracking experiences, but I pushed myself to do it. I decided there was no point taking on a challenge if I wasn’t going to see it through to the end. So what did I learn from this challenge? Other than discovering I could dig deeper and be more determined than I ever thought possible? 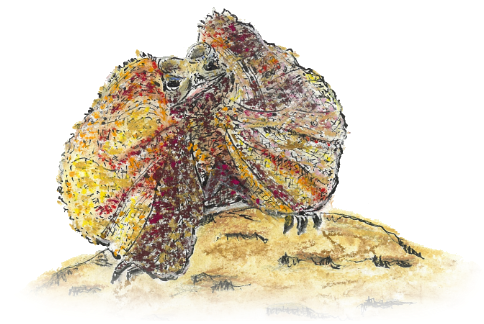 I realised that like my Picture Book character ‘Frazzled Freya,’ it is ok to come out into the midday sun and shine. I can leave my comfort zone, sometimes you just have to take a deep breath and give it a go. Frazzled Freya had to learn to overcome her fears, as did I.
I also learnt how to schedule posts. Before the challenge I had no idea how to do this. I was surprised how simple and easy it actually was. Before the challenge I didn’t even see the need for scheduling posts. I would add something to my page whenever the idea arose. It was random or ad hoc. Now I know the optimal time to post to my page to reach the highest number of my followers and the type of subject matter that will help produce the most engagement with likes and comments. I now know the type of posts you want to see from me and will endeavour to continue to post items that you, my readers, want to read or see. Even if this does include me producing more embarrassing videos. Not quite so surprising my first video didn’t fair quite as well as I had hoped even though it did include a kangaroo hopping through the middle of it. Possibly had I mentioned that in my introduction, more people may have had a look. I believe it was partly due to the timing of the post. Part of this particular challenge was for us all to post at the same time of day, This time didn’t seem to suit my followers and the video was lost in the confusion of the ether. Not that I’m complaining, it wasn’t very good, although for my first attempt I did my nervous best. You can see it for yourself if you like. I am posting it again here to demonstrate how far out of my comfort zone this took me. Overall, it has been a huge learning curve and I promise to continue along my journey this year and strive to give my followers more of the type of content they want. Watch this space, the videos can only improve, (they can’t get any worse!). Thanks so much to all of you who followed along throughout the month of January. I hope you too, have learnt a little something of interest along the way. Thanks for engaging with all the likes, comments and shares. The more you engage, the more I know what sort of information you are looking for from me. Thank you to those of you who are new to my Facebook author page. I am so happy you have decided to join me. This month I have almost reached the 400 followers mark. Let’s see if we can reach that magic number by the end of February. A big huge thanks to Michelle Worthington of ‘Share Your Story’ for organising this awesome challenge. I will strive to grow in confidence. 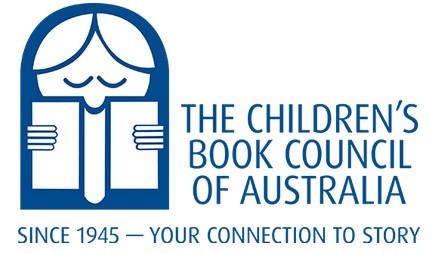 Thanks for all your support and the support of all the other authors who came along on this learning journey with me. Now it’s your turn. What have you learnt this month? Have you challenged yourself in any way? Please leave a comment in the section below. Let’s share our learning journey together. If you enjoyed reading this post, you might also like to read my January post. Spring is in the Air, Join us at the Fair. Spring is in the air...... well almost! We had a glimpse of hope, then in true Canberra form, winter came back with a vengeance as snow has fallen twice within the first week of September. Don't let that keep you indoors this weekend, the weather promises to improve and no matter what else it will be a great Saturday at the fair. Looking for something fun to do with the family? Why not take a short drive into the country and join us to enjoy a day at the Googong Field Day.This Saturday September 9, 2017 being held at St Paul's Church, 1290 Old Cooma Rd, Googong. with plenty to see and do for everyone. Dad can view an exhibit of an historic engine or two. As well as sheep shearing and fencing demonstrations. then wonder through the stalls, stop by and say G'day. come on over and take a look. a day packed with entertainment to be sure. mark it in your diary, this Saturday, 9th Sep, save the date.